Wild: Of the many creatures I’ve yet encountered on the Island, the Iguanodon Vicissitudinis has the distinctly versatile ability to change its primary method of locomotion according is momentary needs. While bipedal, it can employ rapid stabbing attacks with its distinctive thumb spikes. In quadrupedal stance, conversely, it seems to have an endless supply of stamina, even while sprinting! Domesticated: Interestingly, the Iguanodon’s thumb spikes also provide it with the capability to pick seeds out of fruits, allowing a farmer to handily convert stacks of fruits into stacks of seeds for planting. 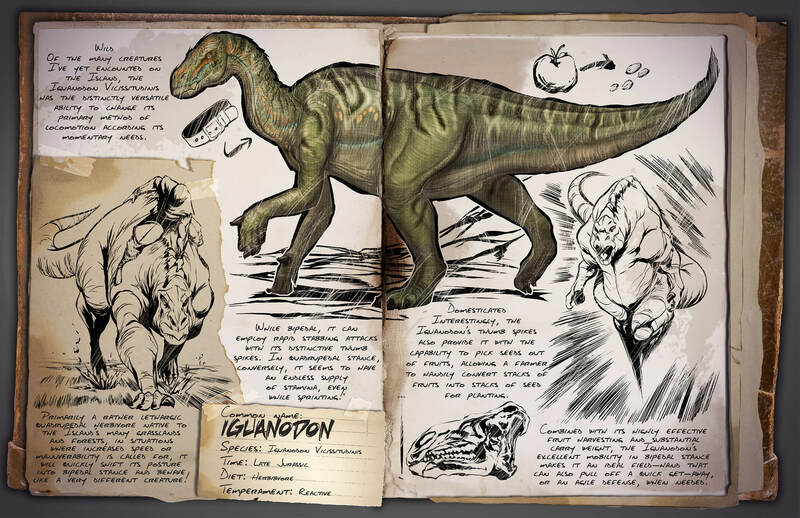 Combined with its highly effective fruit harvesting and substantial carry weight, the Iguanodon’s excellent mobility in bipedal stance make it an ideal field-hand that can also pull off a quick get-away, or an agile defense, when needed. Known Information: Primarily a rather lethargic quadrupedal herbivore native to the Island’s many grasslands and forests, in situations where increased speed or maneuverability is called for, it will quickly shift its posture into bipedal stance and behave like a very different creature! A little fun fact: the thumb spike of the Iguanodon was originally placed on its nose. When further research was done, it appeared that the spike was a modified version of a thumb and placed in the correct position. The dossiers talks about the special ability of harvesting seeds from plants, which for most of us might not be that interesting, but also about an seemingly endless supply of stamina while sprinting. This might mean that the Iguanodon can be used for sprinting over vast amounts of land, making it a perfect creature for exploring the island on foot. They can be a good getaway when in danger.